Legal THC vape juice can be made several ways. First, you'll need to get a hold of some cannabis concentrate that contains THC. These concentrates vary in price and physical form, some have an oil like consistency, while others like shatter have a solid, translucent texture. There are several other types that fall in between these like wax. You have to have a wax pen to vape any of these concentrates by themselves and these become a sticky, wasteful mess in our experience. You have to keep the Thc wax vape pen sitting up in storage or the concentrates leaks out the side. We prefer to use our concentrates in our ejuice mix to vape in any vape pen designed for eliquids. 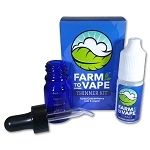 Farm to Vape will turn any concentrate that contains THC into a THC vape juice. Typically THC vape juice contains a cannabis concentrate that has been thinned down to a viscosity that works in vape pens. Farm to Vape does just that. Our Farm to Vape kit contains everything you need (except the legal THC wax) to make up to 15ml of THC vape juice. The potency of the THC vape juice depends on the ratio of Farm to Vape to the legal THC concentrate. The object is to get the liquid thin enough that the power on the vape pen can be turned up high enough to convert THCA to THC in the coil chamber. If the mix is made too thick, The power has to be turned down to not taste burning coil. Preferably, the mix is made at a thinner ratio so you can crank the power, unlocking every last bit of the concentrate in the ejuice mix. So in conclusion, the thinner the THC vape juice viscosity is, the higher you can crank up the wattage in the vape pen. Please visit our instructions for step by step directions or watch one of our how to videos for a more in depth look at how to make your own THC vape juice. Can you use infused coconut oil ?